It’s safe to say that 4moms is one of the MOST innovative companies on the market. Their strollers are a few steps ahead of the competition. The new Moxi model is no different. The integrated technology takes it to a completely new level of strolling. What other stroller has headlights and rechargeable battery on board? While no other companies have integrated technology into their strollers, I think that’s where everything is going. Soon, we’ll be seeing super compact strollers that fold and unfold on their own, that can charge your phone and connect to internet, that have build-in tv with endless channels. You will probably be able to stroll and shop on amazon at the same time. And, when you arrive home from your walk at the park, all the things you’ve ordered will be at your door. LOL. Anyways, back to reality. The Moxi is much more practical model than their Origami model that was too heavy and too bulky. Its most unique feature is a power generator located in the rear wheels that gets changed while you are walking with the stroller. Having a battery on board means you can charge your cell phone, track distance traveled, track temperature and speed you are going with. The built-in LCD screen displays all the information and makes walking much more interesting. The reversible seat converts into a bassinet so you can use it from birth and up to 55 lbs. It also features one-hand deep recline, adjustable handle bar, large basket, flip-flop-friendly brake, large canopy with pop-out sunvisor, and all-wheel suspension. I gave Moxi 4 out 5 stars because while this is a much better model than Origami, it still needs some work. The technology part definitely is a plus, but it’s very basic and primitive. The canopy lacks a viewing window and any kind of mesh. The weight is heavy (29 lbs) and the fold is bulky. But, my biggest problem are the PLASTIC wheels. I do expect to get hard-rubber wheels for that price. Another issue is lack of accessories like bumper bar and child tray. While I can’t get built-in technology in any other stroller, I can get a better functioning stroller for that price. So, the question become if the technology worth the price. To me, it’s not. I am not lifting 5 extra pounds everyday so I can see how much I’ve walked and what the temperature is. I can do it on my phone which I can charge at home. The headlights are useless for me since I don’t walk at night. This buggy retails for $699 and comes with a cup holder. It’s available in black only. -Large canopy. It has two large panels and a pop-out sunvisor that could be tucked away if not needed. Unfortunately, there is no peekaboo window nor any hidden mesh. That’s something that should be added in the next version. -Adjustable handle bar. The telescoping handle bar has 5 positions and goes from 38″ up to 44″ from the ground. It’s covered with soft foam that is very nice to the touch. The only thing I have with the handle bar is that the console gets in the way so you have to adopt a wider grip. The attachments fall right into where I would place my hands. When I push the stroller with one hand I would put my right hand a little to the right instead of the center. -Power generator. The most unusual feature of this model is a built-in power generator. It’s located in the rear wheels and generates power while you walk. The built-in LCD screen lets you know the battery level, distance traveled, temperature outside, and the speed you are going with. There is even an app that connects to your Moxi model where you can view your trip history, adjust stroller settings and customize your calorie burn. The screen definitely makes for more entertaining walks. The USB phone charger is also a very neat feature since my phone runs out of battery quite often. I do spend a lot of time on my phone. LOL. It doesn’t change as fast as your wall charger but does add power at a reasonable rate. -Headlights. Another amazing feature of Moxi is the headlights and the taillights. What? Yes, you can illuminate your pathway while walking at night. While this is a very exciting feature, I rarely walk at night so probably not going to be used that much. -Reversible seat. The reversible seat has one-hand lever recline with three recline positions. The seat can accommodate a child from 6 months and up to 55 lbs, but it can be converted into a bassinet to accommodate a newborn. It has the same recline positions in both modes. All the seat fabrics are removable and machine washable, but make sure to air dry them. -Bassinet. INCLUDED! The seat can convert into a bassinet for your newborn. I have to tell you, it’s very convenient to have a built-in bassinet. No need to buy and store an extra item. Release two clips underneath the seat and whola! You have a pram! Easy. The downside of course is the smaller seat and the bulkier fold. So while it’s perfect for a newborn, your toddler might have to bend his knees a little higher. The canopy also not as high as on some of the other strollers, but it’s not a big deal since most toddlers don’t care about canopy anyways. Keep in mind, you will not be able to use this bassinet as an extra sleeping place for your child. Also, I found it to be a little shallow and not as deep as some of the stand alone bassinets. -5 point harness. This adjustable padded 5-point harness with a center release buckle. -Storage pocket. There is a small storage pocket located underneath the dashboard that you can use for storing small items like your keys, cell phone, or wallet. -Cup holder. INCLUDED! It’s nice to have an included cup holder since many strollers don’t come with them. It works well for a medium size cup you would get at a fast food place or a regular water bottle. It does stick out a bit because of the side placement and makes the stroller wider and more challenging to get through narrow doorways. I wish I could rotate it. -Parking brake. The single parking flip-flop-friendly brake located on the right wheel. -Large basket. The basket is great. You will be able to fit a large diaper bag plus bunch of other stuff. It’s also easy to access from the back and both sides. -Wheels. It rolls on four hard plastic wheels with 10″ wheels in the back and 7″ wheels in the front. The front wheels are swivel, but can be locked straight. I think the wheels is my biggest problem with this stroller. Hard plastic? Really? For that price… It works best on flat surfaces and can tackle some terrain, but this is definitely not your all-terrain stroller. -All-wheel suspension. It has front and rear wheel suspension. -One-step fold. The fold is very easy, but will require both hands. It does NOT fold automatically like Origami model. You will need to fold it manually. There is an automatic lock, but no standing fold. Since the seat is one molded piece with non-adjustable leg rest the frame of the seat does not fold at all. So it’s a very bulky fold that will take up all the room in your trunk. Here is a photo of Moxi in the trunk of a compact car. The folded dimensions are 16″H x 24″W x 35″L. It kind of folds down only and not lengthwise nor width-wise. On top of being bulky, it’s also very heavy at 29 lbs. While you can fold it with the seat attached, it’s more compact to fold the frame first and then put the seat on top of it. I don’t recommend putting anything on top of this folded package since the seat material is exposed and can easily get damaged or dirty. -Travel system option. 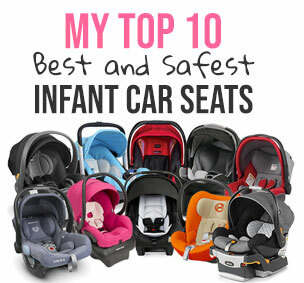 You can easily convert Moxi into a travel system with 4moms, Moxi Cosi, Cybex, Chicco and Britax car seats. Adapters sold separately. -No peekaboo window. Most canopies have a viewing window, so it would be a nice addition. -No mesh. It can get pretty hot during summer months, so a hidden mesh for better air circulation is always a plus. -No adjustable leg rest. I do like to give my little baby an extra room to stretch her little legs. Also adjustable leg rest work well during diaper changes. -No bumper bar, no child tray. The lack of bumper bar and child tray is a little surprising. It’s not even available for purchase. -Heavy weight. At 29 lbs Moxi is definitely on the heavier side for this type of stroller. I have to tell you, the weight feels much heavier than 29 lbs because of the bulky package. More like 35 lbs. I found that when you lift a smaller package it doesn’t feel as heavy as if it’s bulky. -Bulky fold. It looks like Moxi only folds down and doesn’t get smaller lengthwise. -Console location. The attached console is a nice feature, but it does get in the way when I want to push stroller with just one hand. 4moms provides 2-year warranty from the original date of purchase and you have to be the original owner. Here is more information on the warranty. 4moms Moxi comes in black color with a black frame. My favorite place to buy strollers and a lot of other baby items is Amazon. It usually has the lowest prices, free shipping, free returns and no sales tax. How great is that? You can get 4moms Moxi in black for around $699 on Amazon (free shipping/free returns and no sales tax). It comes with a cup holder.